Archbishop Denis Hart, Metropolitan Archbishop of Melbourne has been elected as the President of the Australian Catholic Bishops Conference at the Australian Bishops Plenary today in Sydney. Archbishop Hart will take over after this meeting from Archbishop Philip Wilson who has held the post for the past six years. Archbishop Hart is delighted to have been chosen to serve the Church in Australia in this way. “I am pleased to be able to serve the Church in any way that I can. I hope to see the faith of Catholics in Jesus Christ grow in this country. I am also grateful for the faith that my brother Bishops have placed in me”. “The role of President is one which I will take seriously, and I am humbled to have been elected”, he said. The Bishops Conference President is elected every two years and can serve up to three terms. 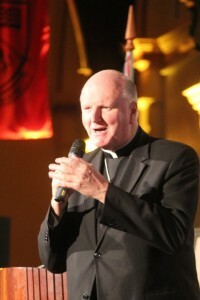 Archbishop Denis James Hart, DD was named auxiliary Bishop of Melbourne in 1997 and has been the Archbishop of Melbourne since 2001. In the Australian Catholic Bishops Conference he has been Chairman of the Bishops Commission for Administration and Information, as well as being a member of the Permanent Committee and of the Bishops Commission for Liturgy. He is also vice-chairman of the International Commission on English in the Liturgy. Archbishop Philip Wilson was also elected today as the Vice-President of the Conference. This entry was posted in Press Releases, Uncategorized on May 4, 2012 by Mark Wei.